Spoiler Pirate says "Yarrrr, there be spoilers ahead!" Dear Esther was released in June of last year, but it wasn't until the game received some attention recently that it piqued my interest. 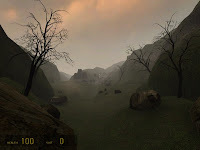 Created as a research project by Dan Pinchbeck at the University of Portsmouth, UK, this Source Mod is pensive and unsettling, a unique creation amidst the crowded mod scene. Though more of an interactive fiction than a game, Dear Esther evokes a sensation traditional games rarely even strive for: solitude. This game is difficult to discuss for a multitude of reasons, primarily because of its somewhat randomized narration. Periodically, exploration of the abandoned island will be punctuated by a voice over randomly selected from a few narrative options . The story is disjointed, yet maintains a quiet tone tinged with fear and loneliness. Twice my story began as follows: "The gulls do not land here anymore." The island remains the same, an integral narrative element and its own beacon of solitude. From the outset, the shore recedes into fog with barely a hint of land beyond. A small bird takes wing at the games onset, but there is not the raucous sound of seagulls roosting on the cliff side. The absence of certain sounds is distressing and enhances the feeling of solitude. Without the sound of other living creatures, the sound of footsteps, the wind, and the surf seem all the more oppressive, as if these all exist within a vacuum. The music, narrations, strange electronic humming and periodic whispers appear as hauntings, products of the island or memories or hallucinations. It is difficult to know whether the protagonist, or the narrator (presuming they are not one and the same), embrace their solitude. Two vast scars are cut into the cliff face, warding off potential rescuers and ensuring the eternal privacy of the island and its one inhabitant. The story tells of a hermit who once occupied the island, no doubt in search of some greater truth, whom never revealed himself to the island's occupants. The narrator laments: "I appear to be an unworthy subject of his solitude." The narrator is (or was?) supremely isolated, with only the ghostly memory of a hermit to keep him company. 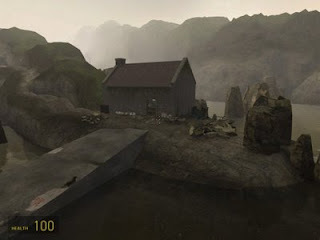 Dear Esther is populated by incorporeal ghosts like the hermit, simple reminders of people long gone. The opening scene is of a barren house, an overturned chair and boxes for left-overs, which reveal a life long abandoned. Similarly, strange drawings are scrawled across the island - circuits, chemical formulas and words. These are joined by other artifacts - rusted ships and cargo strewn about the shore, the weathered dwellings of the sheep herders who once lived on the island, and abandoned paper boat. These worn down remnants of a bleak existence create a palimpsest of the island and the man it represents. While walking across the island another person appears and vanishes on two occasions. I was eager to chase this person down, only to feel a growing sense of solitude at its disappearance. The ephemeral character who walks the island could be any number of characters: the narrator, the hermit, Paul, Donnelly, Esther, a fleeting combination of any one of these. The shadow of those who once existed, in physical form or merely mentioned, makes their absence palpable, engulfing the protagonist in solitude. This experience aligns with the narrative, the terrible feeling of loss the narrator suffers at the death of his wife. At times the island feels like a tangible love letter, at times a suicide note. The music and story culminate into something potentially coherent. Past characters merge and Dear Esther becomes a story about the terrifying solitude of loss. The title itself is the first inscription of a goodbye letter to someone who will never read it. Dear Esther evokes a powerful sense of solitude by surrounding you with the absence of what was.